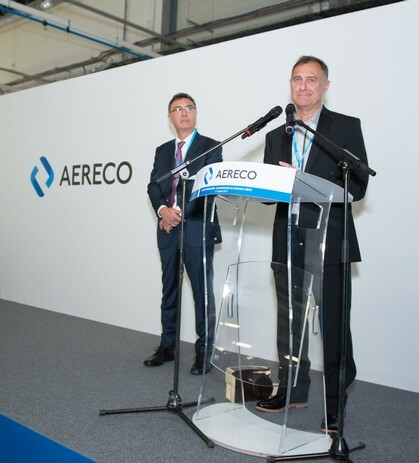 On October, the 17th of 2014, Aereco S.A. has inaugurated its new headquarters and new plant in Collégien (France), attended by over 500 people from 20 different countries. The inaugural speech was opened byMarc Jardinier, the Aereco CEO, who thanked all the present guests, customers, suppliers, subsidiaries, financial partners, regional development actors, officials, and employees of the company. All of them have contributed to the development of the company, through their commitment. Marc Jardinier had a historical overview of the company since its birth in 1984, expressing his pride to watch the development since these last thirty years. Then, Alexandre Chirier, Economic Development and Marketing Director of EpaMarne, spoke on behalf of the EpaMarne Director, Nicolas Ferrand, who joined us later. He insisted on the importance for the region of companies such as Aereco, emphasizing the ambition, attractiveness and vitality of Marne-la-Vallée. Finally, we had the honour to welcome Eduardo Rihan-Cypel, Seine-et-Marne’s department Member of Parliament, who recalled that in these difficult economic times, it is important to support and show as example companies involved in keeping the employment in France and in Seine-et-Marne department in particular. From left to right, Didier Meriot (1st Collégien Mayor Deputy), Nicolas Ferrand (EpaMarne Director), Eduardo Rihan-Cypel (Seine-et-Marne Congressman), Edwige Lagouge (2nd Collégien Mayor Deputy and member of the Marne et Gondoire community office), Marc Jardinier (Aereco CEO), Laurent Jardinier (Aereco Executive Officer). After the traditional ribbon cutting, participants shared a gourmet buffet and enjoyed various activities around the air theme on a stand inside our production plant. During the day, guided factory tours enabled to introduce our 18 000 sqm building, in use since May 2014, after only a year of work. Designed by the architect Frank Tomassi, the building has been constructed by the Salini company. The guided factory tours have showcased our fully modernized production installations and our equipments dedicated to Research and Development. We wish to thank all our visitors for their presence, and all those who helped to make this event a unique day, with their involvement and participation.